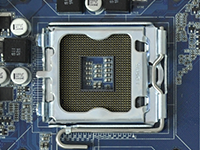 Intel's LGA775 (also known as socket T) was released back in 2006 and was Intel's first CPU to feature pins on the motherboard and pads on the processor, rather than previous designs where pins on the CPU fitted into sockets on the motherboard. Intel changed from Socket 478 to LGA775 because the new pin type offers better power distribution to the processor, allowing the front side bus to be raised to 1600 MT/s. There are many CPUs available compatible with this socket type and the heat generation can vary significantly. For example, the Celeron D 450 generates a mere 35W, whilst the Core 2 Extreme QX9770 can run at a massive 136W!